Everyone knows what magnetic attraction is. Judging by women’s behaviors at jewelry shows, women are magnetically attracted to jewelry in every form; necklaces, rings, bracelets, toe-rings, earrings and even simple studs. However, I have always seemed to repel jewelry. It has always moved away from me. From the age of 13 when I lost my grandmother’s turquoise engagement ring in a swimming pool to the piles of inexpensive pieces left on the bookshelves of Air B&Bs, jewelry seems to pull in the opposite direction from me. Once years ago, I didn’t want to weight-train with an emerald ring on. I put it in the glove compartment of my car. Land Rovers are very hard to break into. I thought that would be safer than putting it in a locker at the particular gym I went to at the time. My car was stolen while I was in the gym. The thieves, two women, broke into my locker, took the car keys, and drove my car away. When the car was recovered, the ring was gone but several c.ds of gospel music had been left in the back seat, which brought to mind some pretty hilarious images. From the diamond pendant from a former boyfriend that wemt down a shower drain to the sapphire necklace that disappeared from a dresser drawer (I have my suspicions. I admit being unbelievably predictable about where I hid it), after 30 years of adult existence, I had less than 10 pieces of jewelry, including wooden Mala beads. Even after I started going to Mexico, no matter how I packed them, my necklaces got so knotted by the time I arrived, they ended up laying on nightstands the whole time I was there. I’d helplessly take them back to Denver for a jewelry designer friend to unknot for me. So why, with this terrible history and locomotive lifestyle am I suddenly into buying Mexican silver jewelry? You can’t have a portable feast of a life with a full closet. Every six months you are packing and repacking. After a few years of this, you begin to shuck off items you haven’t worn in the last few years. I make due with about 10 outfits a season (plus a wardrobe of work-out wear). The exigencies of part-time expat life don’t come without a periodic sense of deprivation. I am always seeking the balance between the simple life that I’ve painstakingly developed against feelings of rootlessness. From time to time, that encroaching feeling of being unmoored stokes the desire to take care of something, like silver. Rather than “just traveling through,” wearing jewelry has begun to make me feel more rooted. Silver holds me down. After age 12, our wardrobes drift relentlessly toward neutrals. By age 25, at least a quarter of your wardrobe is black. Travel clothes and core clothing are black. You pack black jeans, black jackets, black boots, and black leather jackets. Chunks of silver (even if not real) stand out against black. All of which takes me to Mexican silver. As you may have noticed from my previous blogs, I am growing rather fond of Mexico. I am more committed to it every day. When I wear Mexico’s silver, I feel like Mexico is committing to me too. Wearing it, I feel like I’m wearing part of Mexico’s history and culture. The history of silver in Mexico is a big part of its history in relation to the world. At one time Mexico provided over a third of the world’s silver. Only a year into Spain’s conquest of Mexico in 1521, Hernan Cortes made claim to mining silver in Taxco, a city south of Mexico City. Intermittently, new veins were discovered there. This part of Mexico became world-renowned for its high-quality silver. Once these rich veins of silver were emptied, leave it to American marketing ingenuity to bring Taxco back to its former glory by promoting Taxco as the world center of silver design. William Spratling, an architectural professor at Tulane University in New Orleans, came up with the idea of training local artisans in the design of jewelry. This led to Taxco’s present-day reputation for silver represented by over 300 silver workshops there. As one of Mexico’s Pueblos Magicos, Taxco has charms beyond its silver. People have said that from a distance, the city takes on the qualities of a surreal painting. It is a very popular tourist destination for its architecture, culture, and history. Much of the advice offered on how to buy silver in Taxco can be applied to how to buy Mexican silver anywhere, and it’s worth mentioning here. It’s preferable to buy it from an established source, a store or vendor with a history, a place that will back up your purchase should there be a defect in the work or a repair needs to be made. Make sure the silver is authentic Mexican. Taiwan, China, and Italy also produce silver, but of an inferior quality. If you have purchased silver with a precious stone, you need to ask if the stone is natural. At times a vendor will pass off poor quality stones, (glass or even plastic) as natural stones to reduce the overall cost of the piece. You need to evaluate the gem and the setting separately and determine the value based on the aggregate value of the stone and the setting. It’s weight and design create its value. If embossed or has chisel work, its price will be higher. Ask how the piece is to be cared for. The quality affects the care. It’s not a bad idea to check the price of silver per gram before you shop. The most important thing is to look for the engraved marks of at least 0.925, up to 0.950, 0.970 that indicate high quality. It might also have a marking from its workshop of origin. In addition, if you happen to be traveling to Taxco to shop for silver, it’s advisable to ignore the city guides suggestions of where to shop. Inquire around about established stores that have met all the business legal requirements to sell silver. Be aware that alpaca (an alloy of copper, nickel, and zinc) is often passed off as silver. Alpaca is more brilliant and weighs less than real silver. Its easy to be fooled. From my earliest days in Mexico in Mazatlán, I have heard many anecdotes relating to people buying jewelry that was said to be silver and wasn’t. Monica Zamora Krause, owner of Balaam Design (Balaam means “jaguar” in the Mayan language) designs work for artisans for her silver design operation in Taxco. One of her rings became my first fling in silver (and one that has not yet moved on). I loved how contemporary the piece was. She was kind enough to share some photos of them at work and some advice. 1 Place the piece near a magnet. Unlike nickel, a magnet will not strongly attract real silver. 2. Rub the piece with a soft cloth. Silver, with chemical qualities, tends to give of tarnish with oxidation and the passage of time. If it leaves a blackish mark, it is probably real. Obviously, this isn’t a definitive test. The piece could be brand new or very recently cleaned. 3. Smell it. If the silver is of high quality, it should not have a strong metallic (smelting) aroma. 4. Take a hard-boiled egg with you. Another popular way to test authenticity is to rub the piece with the yolk of a hard-boiled egg. If the yolk darkens, it’s authentic. As I previously mentioned, while I may not be ready for a dog, I do want to take care of a few nice things in my life, like precious symbols of my relationship with Mexico. I love this trick for cleaning silver because it uses household items. I tried it on a terribly tarnished pendant my mother gave me 20 years ago and it worked beautifully. You don’t have to go out and buy or carry a dipping solution in your suitcase. You will need a bowl, salt, water, aluminum foil and a soft cloth. Leave it in the bowl for 15 minutes, moving it a few time. Remove the piece. Buff and dry it thoroughly with the soft cloth . Many of us put on jewelry and go about our day, exposing it to soaps, creams, dish detergents, sugar. which can be corrosive, as can foods like eggs, some fruits, onions, mayonnaise and vinegars. You should clean silver frequently, and right after it’s worn is best. The more you wear these pieces, the less care they take. If the piece requires only maintenance cleaning, warm water, and a soap with no phosphates should be enough. Don’t clean it with other silver pieces, like dinnerware, as it might become scratched. Do not use rubber gloves, as rubber is also corrosive to silver. Store silver only completely dry, and separate from the rest of your jewelry. You can buy special bags for silver or place them in separate plastic baggies. A curious quality to silver is that, unlike gold, it’s almost impossible to wear too much of it. Perhaps it’s because people look at silver a little differently. Its beauty is as much implied by the workmanship and design as by the value of the metal. You admire Mexican silver more like you would fine leather (which can never be gaudy). Whether I will be wearing a piece personally or not, unlike my emerald ring and diamond pendant, I see more than a pretty stone and the precious metal. I see a Mexican craftsman. Several friends of mine have collected Mexican silver for years. They’ve recounted nothing about shower drains, swimming pools or pillaging gospel singers. While I may never match their enviable stashes, I console myself with the growing connection with Mexico that even my few humble pieces represent. Hopefully, my luck in relationships is about to change. Other ways you might pamper yourself in Mexico - and these for less than $35 dollar. Most recent: Small moments in Mexico that have made me part of its whole. Kerry Baker is the author of "The Interactive Guide to Learning Spanish Free Online," an interactive guide that takes you via links to the best free Spanish language tools on the web, ones you will never find in a search. Create your own unique lesson plan every day, or use the Guide's sample lesson plans. Boredom in studying is the biggest deterrent to learning a second language. By using dozens of resources you can keep it fresh. Supplement the material with tips from the book's support page on this site. 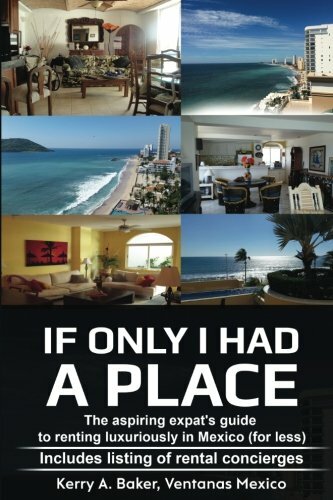 Her second book is "If Only I Had a Place," which presents a holistic system to finding a renting luxurious places for less. Renting in Mexico is different, with bonuses and dangers for the expat. This book has a listing of rental concierges who can preview places before your arrival. What Do Expats Have in Common with an African-American Activist from the 1800's?